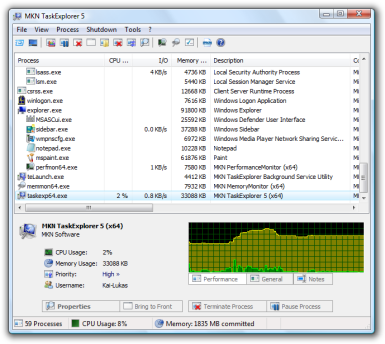 MKN TaskExplorer is a program meant for replacement of Windows Task Manager. MKN TaskExplorer is an advanced process management tool that able to show the detailed information about each process such as performance, memory graphs, DLLs load, threads, possible errors and access token. Additionally, it also shows the information about the handles opened by process and provides a function to read processes ‘virtual memory’. TaskExplorer also features with a function that able to stop and resume the execution process without affect the systems stability or data lose. Beside that it also able to stop, resume and terminate single threads in processes and can create a stack trace for each threads that can helpful for debugging purposes. It also can be launched standalone memory and performance monitors from TaskExplorer with providing graphical and numerical information of the systems activity. TaskExplorer is support on windows 2000 or higher and does not require administrative right to run. It is a freeware and available for .